Uche Okafor (right) and Baba Ajike celebrate after Okafor's game-winning basket vs. Eastern in the 2017-18 season opener for Camden Catholic. The first time was an informal workout on a backyard court in the summer of 2015. The last time will be the 42nd annual Al Carino Basketball Club of South Jersey All-Star Game. In between, there were hundreds of games, practices, workouts, bus rides and road trips for Camden Catholic High School as well as the Team Speed AAU program. Sunday afternoon at Rutgers-Camden, Baba Ajike and Uche Okafor will walk on the court together as teammates for the last time. Uche Okafor averaged 12.9 points and 8.2 rebounds as a senior at Camden Catholic. They met in the summer before entering Camden Catholic as freshmen. Okafor had just arrived in this country as an exchange student from Nigeria and joined Ajike and some others at an informal workout in the backyard of future Haddonfield player Mike DePersia. Ajike, whose parents were born in Nigeria, and Okafor had an instant connection. They’ve been close friends and teammates ever since. “We just clicked,” Ajike said. Okafor said Ajike’s presence as a classmate and teammate smoothed his transition to America. Uche Okafor (right) and Baba Ajike have played together for four years for Camden Catholic as well as the Team Speed AAU program. Both players were starters as freshmen at Camden Catholic. They’ve led the way as the program rallied from an eight-win season in 2015-16 to back-to-back Non-Public South A championships in their junior and senior years. Ajike and Okafor also have been together in spring and summer AAU competition for Team Speed. Sunday’s game also will mark the last time on the court as teammates for the Camden Catholic players as well as Haddonfield players DePersia and Dan Fleming, who were members of the Team Speed squad. “So many of the players that I’ve been with over the years, this will be my last time playing a game with them,” Okafor said. 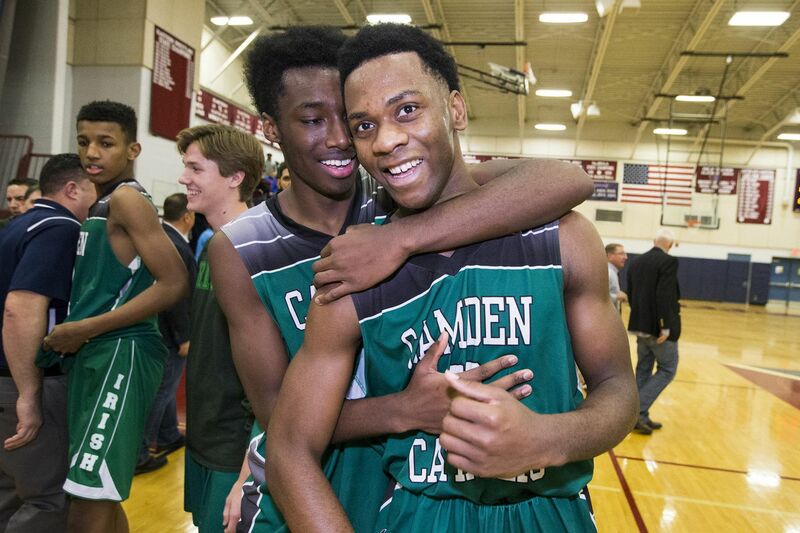 This past season, Ajike and Okafor led Camden Catholic to a 26-4 record and a second straight sectional title and appearance in the state final. Baba Ajike (right, No. 25) averaged 16.6 points and 8.5 rebounds as a senior at Camden Catholic. The 6-foot-6 Ajike, who has a handful of NCAA Division II scholarship offers, averaged 16.6 points and 8.5 rebounds. He shot 55.8 percent from the field and 79.6 percent from the foul line and was second on the team in assists with 88. The 6-6 Okafor, who also has not made a college decision, averaged 12.9 points and 8.2 rebounds. He scored a career-high 33 points with 12 rebounds in a Feb. 1 victory over rival Camden. Baba Ajike, with the trophy after this season's Non-Public South A title, and Uche Okafor led Camden Catholic to back-to-back sectional championships as juniors and seniors. Okafor said Sunday’s game will be a “happy-sad moment” for the Camden Catholic duo. Tim Lenahan Memorial 8th Grade Game, 1 p.m.
High School game, 3 p.m.
East Team: (Coach Dave DeWeese) Kyree Myers, Glassboro; Javon Gordon, Delsea; William Pollick, Kingsway; Josh Wright, Cape May Tech; Darnell Demby, Deptford; Sean Miller, Timber Creek; Rynell Lawrence, Millville; Jake McGonigle, Wildwood Catholic; D.J. Campbell, Vineland; Marcellus Ross, St. Joseph; Connor Deveney, Shawnee; Steve Matlack, Lenape; Jacob Valeus, Pleasantville; Charles Solomon, St. Augustine; Zion Teague, Atlantic City. West Team: (Coach Tony Devlin) Baba Ajike, Camden Catholic; Brian Burns, Haddon Twp. ; Mike DePersia, Haddonfield; Nick Cartwright-Atkins, Moorestown; Anthony DiCaro, Cherokee; Ryan Ems, Eastern; Dan Fleming, Haddonfield; Carl Gibson, Cherry Hill East; Hartnel Haye, Paul VI: Tyshon Judge, Paul VI; Ethan Tarte, Camden; Mattia Morini, Bishop Eustace; Uche Okafor, Camden Catholic; Conor Regan, Gloucester Catholic; Dorien DePina, Clayton. Black Team: (Coach Rob DePersia) Andrew Crawford, St. Rose of Lima; Ian Gross, Beck Middle School; Liam Gorman, Good Sheperd; Latreil Bullock, Voorhees Middle; Naoh Payne, Voorhees Middle; Jordan Underwood, Camden Promise; Stephen Ehrich, Harrington Middle; Ky Gilliam, Uptown Complex Atlantic City; Tekie Vlark, Harrington Middle; Kylief Barfield, Camdem Promise; Matt Augustin, Beck Middle; Lucas Flynn, Rosa Middle; Tim Scarch, Collingswood Middle; Collin Guerry, Harrington Middle. Gray Team: (Coach Rob Ridarelli) Semaj Bethea, Kipp Norcross of Camden; Jabron Solomon, Woodbury Middle; Ayden Hagan, Gateway Middle; Joel Blamon, Cinnaminson Middle; Owen Denton, Williamstown Middle; Josh Dockery, Rohrer Middle; Julian Shorts, Woodbury Middle; Reggie Seldon, Delsea Middle; Joshua Eli, Monogahela Middle; Michael Evans, Winslow Middle; Rocco Pellegrini, Nehaunsey Middle; Zach Cruet, Gateway Middle; Kahil Ali, Pheifer Middle; Deuce Mutts, Harrington Middle; Tieenan Blesi, Indian Mills.